Gounod's Ave Maria has been arranged for viola solo and piano by the world-famous violist Donald McInnes, who held a professorship at the University of Southern California from 1985 to 2014 and is known in virtually every corner of the artistic world for his appearances with major orchestras, recitals, chamber music participation, and numerous master classes. Written by French Romantic composer Charles Gounod in 1859, his Ave Maria consists of a melody superimposed over the Prelude No. 1 in C major, BWV 846, from Book I of The Well-Tempered Clavier, written by J.S. Bach 137 years earlier. 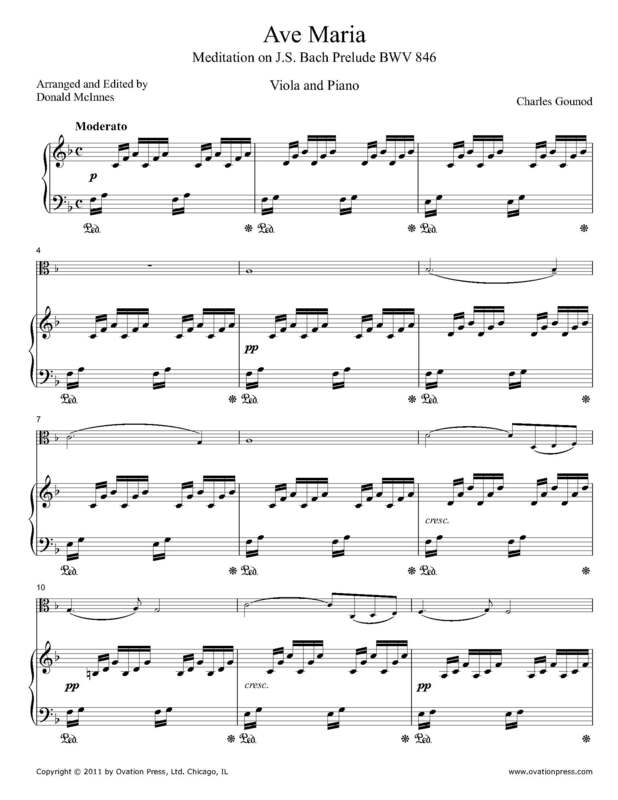 Download and print the score today to gain access to this expertly edited arrangement of Gounod's Ave Maria for viola and piano by Donald McInnes! Ave Maria gratia plena, Dominus tecum.